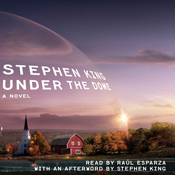 I recently listened to the new Stephen King novel Under the Dome, on audiobook. 34 hours or some such craziness – for ONE credit on audible.com! Awesome. Anyway, I loved it. And I’m not a King fan at all. I was miserable all the way through Misery, made it to part 3 or 4 of The Stand before giving up, but with Shawshank and Stand By Me in mind, I dove into the dome whole-heartedly. It’s about an invisible dome suddenly surrounding a small town in Maine. I kept imagining a dome coming down as I was driving on the highway. Totally crazy to imagine – and King does it in full detail. This is a long one, but it holds your attention throughout. Narration is superb – distinctive voices for all of the huge cast. Although King does go for full detail on some gore and depravity, this isn’t a horror novel at all. I’d say it will appeal to anyone who likes a good small-town story, where the characters rule the roost. Human nature under a magnifying glass. With a little science fiction thrown in for good measure. Highly recommended! It was an idiot crashing into the power pole. But it scared the crapola out of me. Anyway, read the book. Or listen to the audio book.